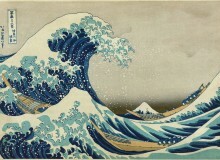 Art enthusiasts needn’t travel far to get their fix in Kagoshima. 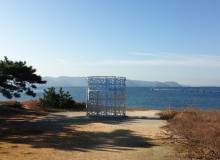 The seaside city, which overlooks the Sakurajima volcano, is home to four different art museums and at least a dozen other cultural centers. But a short 90-minute drive away, high up in the mountains of Yusui Town, is a gallery with a twist: the exhibition is outside. The Kirishima Open-Air Museum sprawls across 13 hectares on a plateau of Mount Kurino, which forms part of the Kirishima-Yaku National Park. 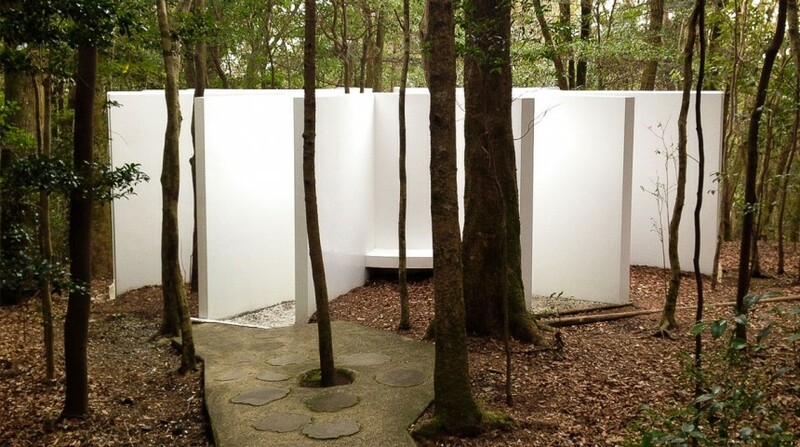 Also known as the Kirishima Art Forest, the gallery curates 22 original outdoor pieces. Created by local and international artists who have all visited the site, the works are inspired by and take advantage of the surrounding nature and topography. A two-kilometer walking trail loops around a bright lawn—green in summer and yellow in winter—and into the nearby forest. Foregoing the guide map here turns a tour into a treasure hunt to find the pieces hidden from view. Even those in plain sight can be difficult to see. How many statues are hiding among the hardwoods in Andrew Gormley’s “Insiders”? Can you spot all of Hiroshi Fuji’s aluminum dogs in the leaves? The trees grow thick and dense up into an artificial ceiling that are a godsend if you visit on a rainy day. You can spend hours staring up at it from the inside of Casagrande & Rintala’s “Forest Observatory.” Its enclosing white walls block out all external sound, creating a quiet space for relaxation and reflection. On a sunny day, Tang Da Wu’s leaf-shaped stain glass projects up to seven different colors on the walking path, and the surfaces of Shuichi Fukumoto’s red and black spheres reflect the clouds and overhanging foliage. 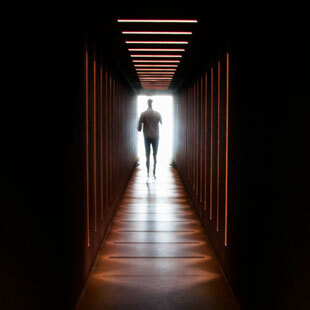 Dani Karavan’s “In the Beginning” similarly plays with light. The one end of the iron tunnel, perched on a cliffside, offers a panoramic view of the forests and valley below. But stand at its other end, and the view changes. The exhibition is highly interactive, with most of the pieces inviting visitors to touch, sit, climb, and play. 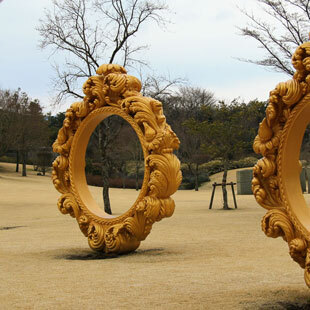 In the sculpture garden, you become the art in Choi Jeonghwa’s giant, golden picture frames, or through superimposed reflections on Dan Graham’s two-way mirror. Hitoshi Ushijima’s “Fort and Hide-out in Kirishima” is a miniature playground of monkey bars, swings, and tunnels that will take you back to childhood—or keep children entertained. Climbing is also encouraged on Phillip King’s “Sun Roots,” a large, red-and-yellow representation of the sun being rooted into the earth. In addition to the permanent outdoor gallery, a hall inside the museum’s main building curates temporary exhibitions. There’s also a coffee shop selling cake and ice-cream that has an impressive selection of gifts and souvenirs, albeit a small one. 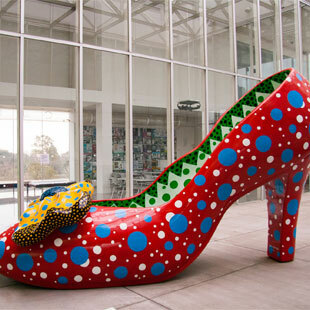 Be sure to also take a commemorative snap with Yayoi Kusama’s “Red Shoe” sculpture just outside, the brightly-colored, polka-dot high heel symbolizing the independence of women. 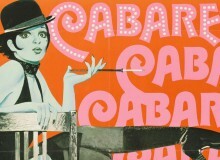 Simone Armer is a writer and photographer who blogs about Japan and other travels at www.lostinthelens.com.